I am running Windows 7 RC1. I have multiple issues getting IIS to work on my system and today when I installed a new application and I tried to load it using http:\localhost\MyApplication I get absolutely no errors and I get no page load. Just a pretty, white blank page. I did some digging and I found something about some other process listening on port 80 so I did a scan using netstat -aon | findstr 0.0:80 and discovered that PID 4 was listening on that port. PID 4 does not show in task manager so I fired up Process Explorer and it showed me that PID 4 is the System process. (Multiple google searches seems to indicate that System always uses PID 4). Since then I am basically stuck. I have no idea why System needs port 80 and what to do about it. If you google the following strings you will find two helpful Experts-Exchange articles at the top of the search results and you can read them for some helpful information. "System Process is listening on port 80 (Vista)"
"SYSTEM Process is listening on Port 80 and Preventing IIS Default Website from Running"
Trace showed nothing useful. Any thoughts? This post on Getting Apache to run on port 80 on Windows 7 (internet archive) describes your point. It seems the 'http.sys' (Windows Remote Management?) service is enabled by default in Windows 7.
the hypen-site does not necessarily have the only answers. 'Web Deployment Agent Service' runs on port 80 as System. You might have this running if you are using WebMatrix. 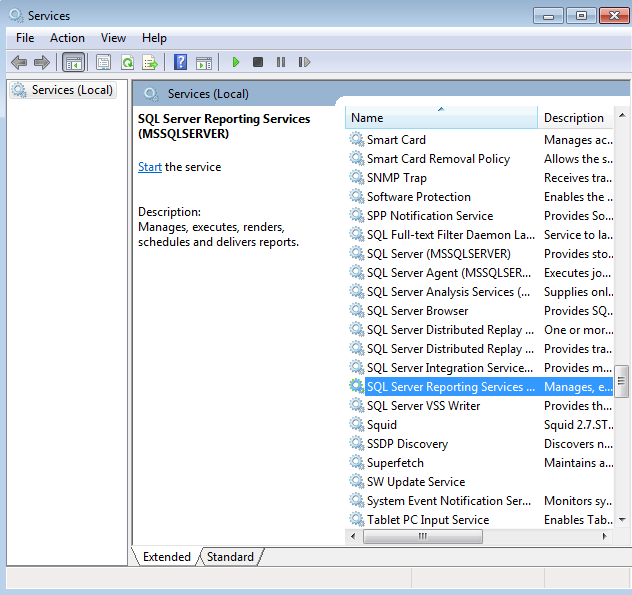 Open Services.msc and stop this service "Sql server reporting services(MSSQLSERVER)"
Right click on "Sql server reporting services(MSSQLSERVER)"
If there are other running services that depend on the HTTP service, you'll get a list; double check to see if there's anything listed there you can't bear to do without. Or, if you're just stopping HTTP to use port 80 temporarily, make a note of those dependent services that you'll want to restart once you're done with the port. Either way, if it's okay, enter y to continue. Later on, you can restart any of the dependent services, using net start or by using the Services item in Administrative Tools, and the HTTP service will be started again automatically. Take ProcessExplorer, run it, open TCP/IP properties of every process (service), find process (service) that listening to http (80) port and switch it off. I found Autodesk EDM Server was listening to http (80) port. Not the answer you're looking for? Browse other questions tagged windows-7 windows or ask your own question. How to know who is listening to port 80 on Windows in multihomed case? Why is System listening on port 8000? Better to block a host to 0.0.0.0 than to 127.0.0.1? What is using port 80? Why is the 'System' process listening on port 443? Why does Windows 10 need Message Queuing service and why the service is installed by default? How do I change the ports that Print Spooler & SSDP Discovery are using in Windows 10 17134?